After a while, Andrea exclaimed, “OK! I’m ready to run again!” Together they took off once again, running side by side. 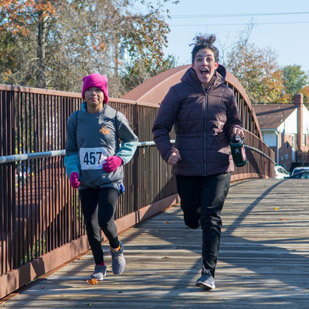 As the race continued, Andrea set the pace when to walk and when to run, and Marissa followed her lead. As the end of the race neared, they caught up to Andrea’s friend Victoria. She had been waiting for them so that they could cross the finish line together. Marissa felt very touched by this as the three joined together towards the finish. When they ran across the finish line together, Marissa was reminded of others in youth programs leading one another with patience. She thought of Andrea leading at her own pace at the 5k and Leo taking charge of a fractions game during Kids Club to help a younger student understand math concepts. And, she reflected on Local Leaders helping one another learn how to manage student behavior this school year – the first for two of them. In all this she felt grateful for the many ways she’s been able to walk alongside students and Local Leaders as they lead. At Casa we are grateful to walk with community members by following their lead, and this year’s 5k was a great physical reminder of that truth.